Coming to the Quarter Pounder sometime next year. Still probably won't convince me to stop in. You still have to wonder, even if it's fresh, is it "good" beef? According to an unscientific poll, on The Howie Carr Show, today, lots of folks agree with you. I'm not in agreement with a lot of RFers, in that I think McD is OK, and I have used it as a base line average................."If a McD quarter pounder is a 5, the XYZ RF place that I am comparing it to might be a 6, as an example. Due to my really uncomfortable diet, I have not been to McD in months, but I did cheat today. Based on the above example, my cheese burger at The Fix burger place (Worcester, Mass) was a 7 or 8. But there's fresh never frozen and fresh ground. Marketing terms or a real difference? WalMart sells "fresh" ground beef in sealed, plastic tubes. It has a really long "sell by" date, and the price per pound is often less than frozen. I've never bought any, so I can't comment on quality. I think that "store ground" burger is an entirely different product, and I think that is the point of your post. It is not uncommon for a better burger joint to grind their own beef. I'll leave it to the pros to say: Do they do it for marketing?, Do they do it for quality?, or do they do it to save money?? Actually, I don't mind the frozen burgers they currently use in their 1/4 pounder line. They are what they are and they're usually tasty enough and juicy enough. Can't say the same for Wendy's. I stopped going there quite a while ago, as their burgers were usually dry and not all that tasty. Fresh beef is good, but not when it's abused on the grill. There was an article about this in today's paper. It also states, "Employees will cook up the never-frozen beef on a grill when burgers are ordered." That should be interesting. Most times they can't even get MH's "lg. coffee with 3 sugars and 2 creams" order right! Stopped for a (never frozen) "animal style" cheeseburger at In-N-Out Burger today. Great, satisfying, cheese burger and, only $2.60! How can you beat that? Btw, try a few of those very small "spicy heat bomb" peppers at the condiment stand. Terrific! According to the paper, McD just had a good quarter, buy focusing on frequent customers. 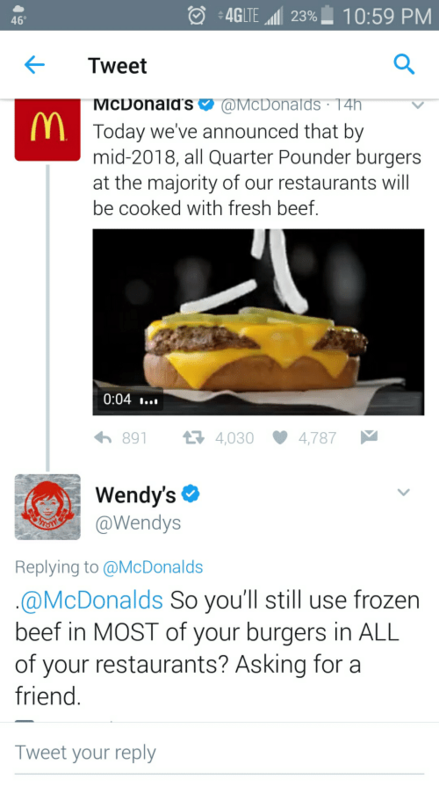 The "fresh" beef isn't even out yet. Chipotle just had a good quarter too, with better same store sales. Just out of curiosity I tried one of McD's "fresh meat" Quarter-Pounders. I really couldn't tell the difference, i.e., no oversized napkin was necessary. AND IT WAS $3.99 !! As both In-N-Out and Five Guys sell the same size patty for a buck less I see no reason to return. Here the 'Little Hamburger' is $4.49 according to Five Guys Online Ordering. It shows the 'Little Hamburger' at $5.19 in the Dallas TX area. It's been a while since I have been to a local Five Guys. I'll have to check my bank account before my next visit! I'll stick to my "animal style" cheeseburger at In-N-Out Burger for $2.60. I had not been to McD in a long time. The $1 menu is gone and prices are higher, but they gave me a little number sign and brought my food to the table. I spent just under $10 for a 1/4 pounder, fries, drink and a salad.It was ok, but I doubt that I'll return soon. Criminy, it's TWELVE buckazoids for a burger, reg fries, and a coke at 5 Guys including tax. I remember the shock on everybody's face when I walked into the office and announced that I had spent 5 bucks at Mac's -- around 1978. Right about the same time they were saying "change back from your dollar." About a year ago I made it out of a White Castle's for < $10, but with no drink. I remember when they cost 6¢. You're right. I DON'T frequent McDonalds at all. My comment was that the food is way overpriced for what you get ie. it's NOT worth what you pay for it...junk food!!! and they're advertising it heavily. who will stop in and see what it buys me. We have the $1, $2, & $3 menu also. A hamburger from them for a dollar is getting closer to what it5's worth, but I still won't go. You're lucky on the West coast having In and Out. They're worth it!!! If you don't frequent McDonald's how do you know that "the food is way overpriced" and "junk"? Of course, I've had them in the past,thus my understanding of the garbage they are, and thus not worth buying, in my humble opinion, at any price!! With all that being said, I'll try the new QP once it's out near me.